TodoToday for Todoist 1.2.0 has been released to the Android Market. TodoToday for Todoist will now show all tasks from Todoist by default. 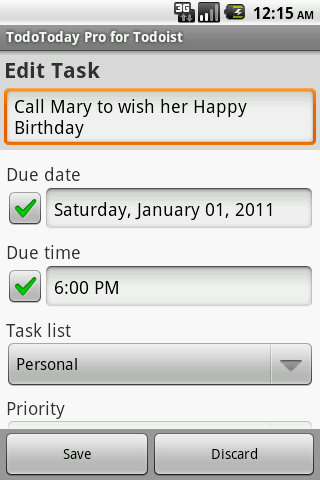 Use the new settings to reduce the number of tasks fetched, to just the due and overdue list. TodoToday Pro for Todoist adds support for editing tasks and selecting task labels. Hint: To add a new label, enter the label in the task name using the @ notation, e.g. @phone.